Cancer stem cells (CSCs) are cancer cells that exhibit several stem cell-like qualities that are characteristic of embryonic or adult stem cells, including self-renewal, differentiation, and the ability to initiate tumorigenesis. CSCs, similar to adult stem cells (ASCs), may also undergo quiescence, a state or period of inactivity or dormancy that contributes to the resistance of CSCs to radiation and/or chemotherapy, potentially allowing CSCs to re-seed tumors at a later time. Fig. 1. Goldsmith Content Providers: CDC/ C. Goldsmith, P. Feorino, E. L. Palmer, W. R. McManus [Public domain], via Wikimedia Commons; By Christaras A (Created myself from anonymized patient MR) [GFDL (http://www.gnu.org/copyleft/fdl.html), CC BY 2.5 (http://creativecommons.org/licenses/by/2.5)], via Wikimedia Commons. 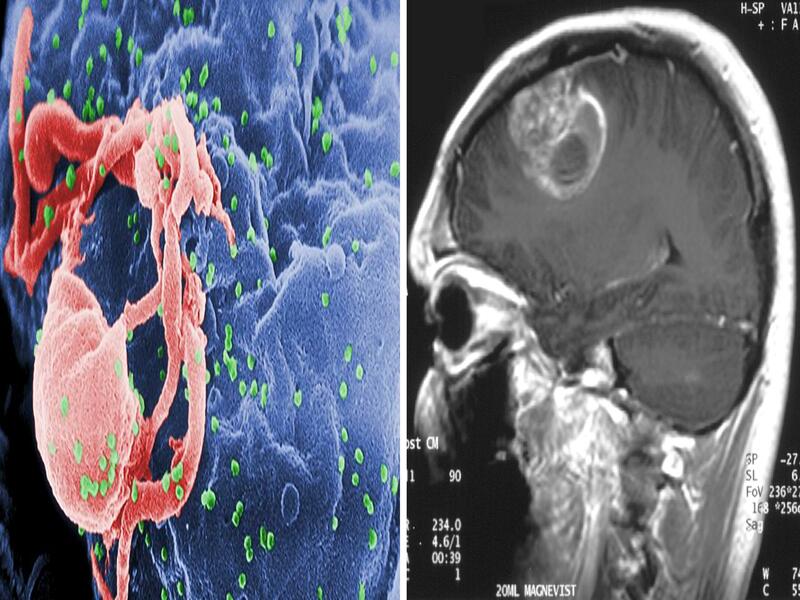 Intriguingly, HIV-1 has been shown to establish durable and long-stating latency, similar to CSC quiescence, in central CD4+ memory T cells as well as in T memory stem cells, T cell subsets that also display stem-cell like qualities including self renewal and differentiation. Latency establishment by HIV-1 in these T cell subsets prevents immune system detection and virus destruction or virus-induced cell death, analogous to CSC quiescence. Because the use of AMPK activators, including metformin, bryostain-1, JQ1, and resveratrol as single agents or in a combinatorial fashion reactivates latent HIV-1 (facilitating virus detection and destruction) and induces CSC differentiation and/or apoptosis, this paper proposes the novel observation that AMPK activation links the reactivation of latent HIV-1 (known as the “shock and kill” approach in HIV-1 cure research) with the “activation”, differentiation, and/or apoptosis of CSCs (which may also be labeled as a “shock and kill” approach). This connection is predicated on the induction of cellular stress (mediated by increases in intracellular calcium [Ca2+] levels, reactive oxygen species [ROS] generation, and/or AMP/ATP ratio increases, etc), leading to beneficial cellular responses that are mediated by the master metabolic regulator AMPK. AMPK is activated by a variety of stressors (osmotic, electrical stimulation, heat stress, pharmacological, etc.). AMPK also increases lifespan and healthspan in several model organisms (e.g. yeast, worms, flies, and mice), is critical for T cell activation and the mounting of an effective immune response, and promotes embryonic, adult, and cancer stem cell differentiation. As the AMPK activator metformin has also recently been shown to destabilize the latent HIV-1 reservoir in chronically-infected HIV patients, AMPK activation likely represents a common mechanism for the elimination of CSCs and the potential eradication of HIV-1. Elimination of cancer stem cells and reactivation of latent HIV-1 via AMPK activation: Common mechanism of action linking inhibition of tumorigenesis and the potential eradication of HIV-1.